These volleyball practice drills give tips how to improve serve receive and serving skills. How to run a serving and passing drill? Advanced Volleyball Practice Drills - How to Improve Serving and Serve Receive? First, the servers (S1, S2, S3, S4 in the picture) have to place the serve to section 1. This section 1 is the 7,5 feet or 2,33 m area next to right side line. From the back line all the way to the net. Even if there will be a passer (P1 in the picture) on the court, still the small section should be used as a target - the serve needs to land on it. Important! The passer stands on his/her natural serve receive position. Therefore the balls should be landing his/her right side. Even if passer knows what is the goal of the serve, the coach needs to make sure that passer doesn’t cheat and stand in the middle of the narrow area to pass. The coach needs to make sure players on the serve receive use the same positions as in the match. After the first section players serve to the second section (which is the 2nd quarter of the court). 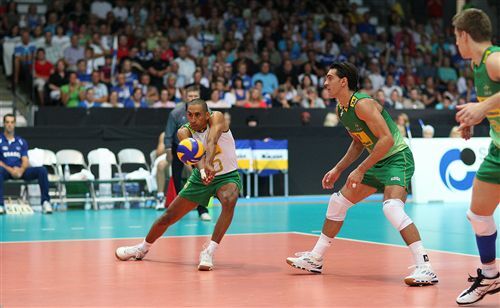 To repeat, the passer or two passers as in the picture needs to stand in natural serving position. Not right under the ball, in the middle of the small section. The coach can add another passer (P2) in the drill as in the picture, when working on the second or the third quarter. It teaches players to learn to pass the ball between the players. (Between P1 and P2 in the picture). To add practice efficiency the coach should also have at least one passer and several servers working on the other side of the court. Why to Use Target Zones? Of course the coach can use other areas or targets for the servers. We have found out those four sections work very well for both passers and servers. 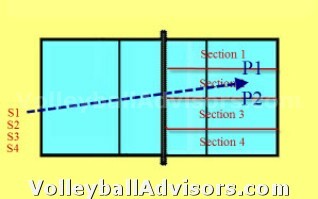 Four smaller zones work well with the passers since now they are able to pass harder serves which land i.e. exactly between the players. This drill helps servers to land their serve into the small zone one after another. Servers should mix up their serves and really challenge the passers. They should serve hard jump serves, floaters, short or deep serves. The coach could run a wash drill between the passers and servers - and counting points between them. If the purpose is to work on power serves and receiving those - it may not take any sense to give penalty on every missed serve. A wash drill works great with servers and passers, not just between defense and offense. How many servers for each passer? It is very recommended there are several, at least 3 servers for each passer. It makes sure the tempo will be fast for the passers. And the players have enough time to focus on each serve they do – just like in the match. Volleyball Practice Drills – Too Easy for Experienced Players? There is an important thought behind this drill. Serving to this specific section is probably an easy task for an experienced player. Experienced players are probably able to do so without any problems. However, this drill is specifically made for players to practice their hard servers. In this drill it is very important that servers hit their serves with power. They are absolutely allowed to miss several serves. That is the only way players will learn to deliver hard serves into that area in the match. The missed serve is not a big deal for the practice flow because there is another person ready to serve right after. Volleyball Practice Drills – Why this volleyball drill is beneficial both servers and passers? This drill works very well for the passers. Now they have an opportunity to pass the hard serves since the serves land on the small zone. If the area is too big, serve receivers struggle, get frustrated and lose the confidence. Why the smaller target area is important? If the area would be bigger and servers would rip their best serves with power – obviously passers would struggle constantly, which does not improve their passing skills. The purpose is to make passers feel comfortable and have opportunity to pass hard serves up. This drill will act as a huge confidence booster for the servers when they see they are able to serve the as hard as they can to a small area. It will be difficult first, but after a while servers notice they are able to hammer the ball into the target area. When players’ skills get better, the coach can make the section even smaller. Volleyball Practice Drills – Why Four Target Areas? In case you are wondering why we divided the court into four areas, here is the reasoning for it. Usually in the match there are three passers on every rotation, which means servers choose between four areas to target the ball. (Two lines and two seams between the passers). In this drill we practice placing ball into those four spots. One more time; by dividing into four target areas players learn to serve on the lines and between the imaginery 3 passers. In the match servers have both lines (2 of them) and also the seams (2 of them) to place their serve. The seams are the spots between the passers in the middle of the court. It is important the players serve each of those sections one at the time. Why? Serving to the seam between the players or to the line with the power is not an easy skill to learn. The best way to learn to do it constantly is through repetitions, one after another. After the player has practiced serving to the same spot one after another and gets hang of it, the player moves into the next spot. This drill sounds really odd - and a little bit complicated. However, just believe us - it works!! One day we just came up with the sections out of the blue, tested them and been using those since then. These drills have been working extremely well. To get volleyball practice drills into next level the coach needs to make the drills more game-like. In this drill the coach could could add a setter and allow passers to swing after a pass - of course against the block. Or alternatively the coach can add a separate hitter to swing the ball. Defensive players should be put on the court to dig the spiker. It is more game-like for the hitters and blockers to use blockers who has to read the setter, move and set up the block. However, keep in mind what we talked about blocking earlier. If you want to make spiking a real challenge for the hitters and build a steady block in front of them every time, put could put the blockers on the stand. That way hitters will always have a decent block in front of them - they have to hit line or angle to beat the block. This could be an option for less experienced teams who may struggle to set a decent block for the hitters. 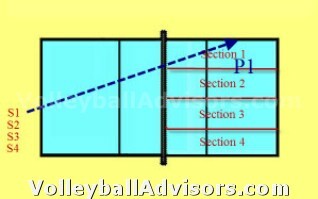 Click the "Volleyball Strategies - Understanding Serve/Serve Receive"- link. Be sure to take a look at "how to build teamwork" with some interesting practice drills.